Kala Craun and her son Craig hold signs they made for the Kris Allen watch party at New Life Church on Tuesday. Kim Duvall, with her daughter Abby, 5, text in her vote to American Idol during the Kris Allen watch party at New Life Church on Tuesday. Well, it's official. Conway has gone 'Kris Allen' crazy! All the businesses in town have signs asking people to go to the watch parties or vote for Kris. Kris' wife, Katy, works at Acxiom (the same place I work) and every week, we get emails saying "Be sure and vote for Kris!" 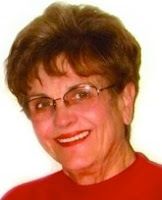 I went to one of my favorite little shops in town called Just T's-N, last Saturday, and they had tons of t-shirts printed up in several colors with the words "Kick Awesome - Kris Allen" printed on them. Several people were in line buying them while I was browsing. One lady asked what the phrase "Kick Awesome" meant. I listened in on the answer since I was curious too. In an interview, Kris was asked to describe his experience on the show so far and he said that he wants to live life with no regrets and this has been kick awesome. So now the phrase "Kick Awesome" has become the Kris Allen battle cry around town. I wanted to go to the American Idol official watch party in town last night but when I arrived, there was no place to park. The parking lot attendant told me that if I wanted to, I could park at the church across the street. Well, it was pouring down rain and I could tell by looking at all the cars that it would be standing-room-only, and with my claustrophobic tendencies, I decided to skip the party all-together. I sure did my share of voting though. I had both my landline and my cell phones dialing. Whew! Last week, they had the watch party at the UCA Farris Center (where there were 2000 in attendance) but this week they held the party at New Life Church, where Kris serves as worship leader. When I heard they were going to have the watch party at New Life Church, I told my husband that I didn't think the church could hold all the people. I found out later that the reason they couldn't have the watch party at the Farris Center was due to graduation. I just hope he makes it into the 'Top 3'. 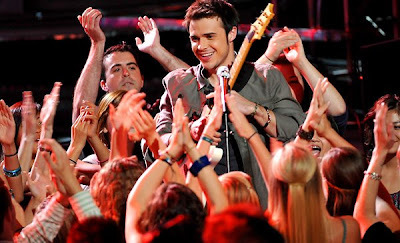 My 16-year-old son says there is a rumor around school that if Kris makes it into the 'Top 3', the school will let the kids out early Friday, so they can attend the Kris Allen homecoming parade and concert in Simon Park. Exciting times around good ole' Conway! It will be interesting to see how this all plays out here in Conway, if Kris Allen does indeed advance to the final three of American Idol. I know all of the kids are rooting for him, so they can get out of school early!